Eastern State Penitentiary in Philadelphia held murderers, gangsters and the criminally insane for over 150 years before it was abandoned. Between Christmas and New Year’s of 2001, I spent the night there. Excerpt from "An Evening on Death Row" in Ghost Investigator, Volume 2. Next stop—Death Row. It was one of the more modern buildings, consisting of two floors with two rows of cells placed back to back. Darkness had now fallen and only the dim light of some distant buildings revealed the bleak, stark lines of cells. Mike and I decided to set up our camcorders at opposite ends of the row on the western side of the top floor. I took the back wall, while he set up at the entrance. Our guide Brian remained outside, but I suggested that everyone else pick a cell and sit quietly while the cameras taped in infrared. Even as I was setting up the camera, I could see on the view screen that there were several small, white spots moving around in front of me. As it was a dusty, dirty place, airborne particles could account for those spots, but dust couldn’t account for everything that happened on death row that night. This is most likely a massive understatement, but there is nothing quite like the feeling of sitting alone in the silent blackness of a death row cell in a cold, abandoned prison. You cannot help but experience the desolation and the hopelessness, and you cannot help but imagine the violence, cruelty and the perversity of the men who spent their final days on earth caged up in those small spaces. 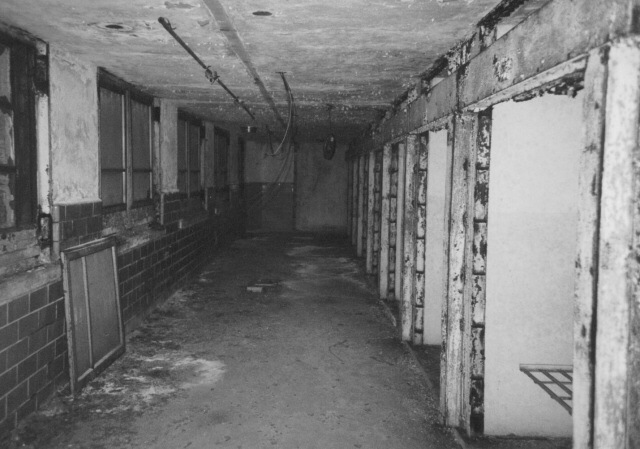 These cells contained the worst examples humanity could offer, men who committed unspeakable atrocities, men who even in there last hours reached through those bars grasping at guards, hoping to kill one last victim before they themselves were executed. There were also those who realized the mistakes they had made, and lived every last minute in fear, desperation and anguish over the fate that awaited them. These cells once contained the greatest concentration of evil and torment, and it was in these cells that we sat, hearts pumping, minds racing, wondering what could happen. When I returned a few days later, a television crew captured more bizarre phenomena. The following is just a taste of what happens at this very haunted old restaurant. …We decided to investigate the meat locker where the busboy had been trapped. I opened the door, and tried to take a step forward, but was jerked to a stop. Someone had a hold of my coat and I couldn’t move. For god’s sake, I thought, more than a bit exasperated, I know these people are scared, but they’re all adults. Did someone really have to grab hold of my coat like a little kid? In a way, I couldn’t have been more right, although I didn’t know it at that moment. I asked who was holding me, and everyone replied that no one was even touching me. I then thought that my coat must have gotten caught on some type of hook, but in the darkness I ran my hand up and down the smooth wood frame and found that not a single hook or latch was there. There was simply nothing on which to get caught. Then I decided I had better take a step back, and I was suddenly released from whatever had gripped me. Sandy Tomcho, one of the reporters from the Times Herald Record, was directly behind me, and she said that even though it was very dimly lit, she had clearly seen my coat sticking out straight behind me, but she couldn’t see anything holding onto it! Tony turned on the lights, and we could not find any reason for my coat to have refused to follow me into the meat locker. Could this have been the spirit of little Elizabeth Smalley, who has been known to literally grab people’s attention? Just a few days earlier, I had given a lecture and someone asked if I had ever been physically in the grasp of an entity, and I had said no. That night after visiting Smalley’s, I had another lecture and was asked the same question. This time I couldn’t say no. As startling as this "death grip" was, I didn’t have time to ponder its implications. We moved back to the infamous basement staircase, and weren’t disappointed. Those very heavy footsteps passed directly overhead once again. I can’t emphasize enough how clear they were. It wasn’t as if there was some vague creaking of floorboards somewhere—these were unmistakable footsteps directly on the floor above us. No questions, no doubts. These doors are at the top of the stairs where we heard the heavy footsteps and banging sounds. At one point, these doors opened by themselves. The bright spots on the gray part of the doors cannot be reflections—that is gray fabric, which couldn’t possibly reflect light.